LEATHER-CHOKER:H&M TREND. 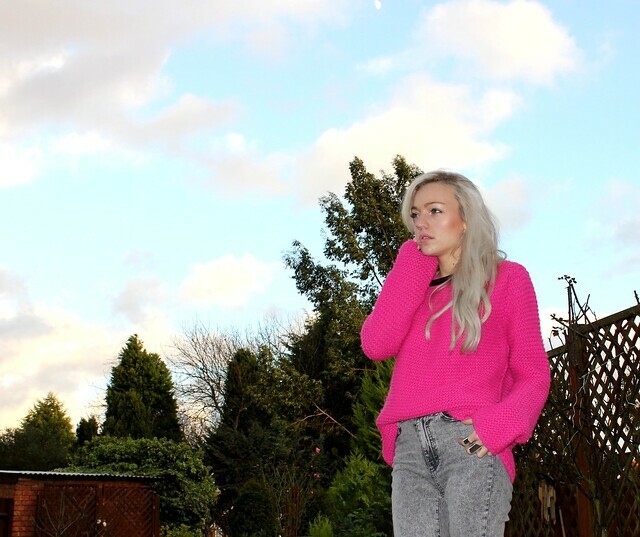 JUMPER:ZARA. JEANS:H&M. SHOE-BOOT:H&M TREND. As most in industry(well) we're all over a/w as soon as the s/s catwalk reports come in! I know aswell as Pastels, flashes of Neon are going to be huge for s/s12 so I'm already trying to incorporate them into my winter outfits because I'm excited about whats next and bored with whats been. Fashion is a strange occupation because we are constantly looking a season if not two ahead whilst the rest of the general public go about buying into 'current' magazines and trends.. which tbh is what makes sense right? I constantly have this debate with my bf, who for obvious reasons isn't as up-to-the-minute obsessed with whats happening next (I just make him listen to me, poor lad!). We knuckled it down to three categories.. The Fashion leaders, followers and copycats, and then there are those who just couldnt care less. Without the names sounding too offensive 'leaders' refers more to those who try to stay ahead, hunt out new trends, will brave new and sometimes strange looks before most, care about the catwalks, and don't want to look like the majority. It's about a need for new and getting bored easily of whats been done! 'Followers' I would say is more mainstream and what the majority of stylish people come under once the trends have hit the highstreet and become more accepted. They don't take as many risks but then they always look presentable and 'trendy'. Basically, they keep up! 'Copycats' are those who eventually get air of what everyones wearing, and usually its exactly that.. everyone is wearing it and that can become boring for most but these types will only brave to wear something once they know its been socially accepted and thouroughly trialed and tested so they don't end up a laughing stock like those of us that first try head-to-toe leather Fetish..
No Matter what group you fall into (not that I like to generalise) who's to say what's right and wrong and ultimately, if it even matters?! I Love the profession I'm going into, honestly(and quite sadly) nothing makes me happier, but even I often sit back and laugh at how shallow and meaningless it all is.. Sometimes I even wonder if it'd have been more interesting to have followed a different career path, but then, I remember.. I love clothes! But no on a serious note, I could also argue the whole other side of things, that we all have to wear clothes.. and so people need to design the clothes and bladdy blah blah, but we'd be here all day so I'll save that for another post. WHERE WOULD YOU FALL IN MY CATEGORIES? I love this outfit, especially the jeans. And I know exactly what you mean, I kinda feel the same about a marketing module I am doing at uni, I hate learning about it because I know marketing works so well on me haha! Love your fashion sense! Is the jumper in stores at the moment? loving it!